Julia Conard is one of the most revered players in West Chicago High School volleyball history. As an outside hitter, she became the school's all-time kills leader and paced the Wildcats to conference and regional championships in 2011. 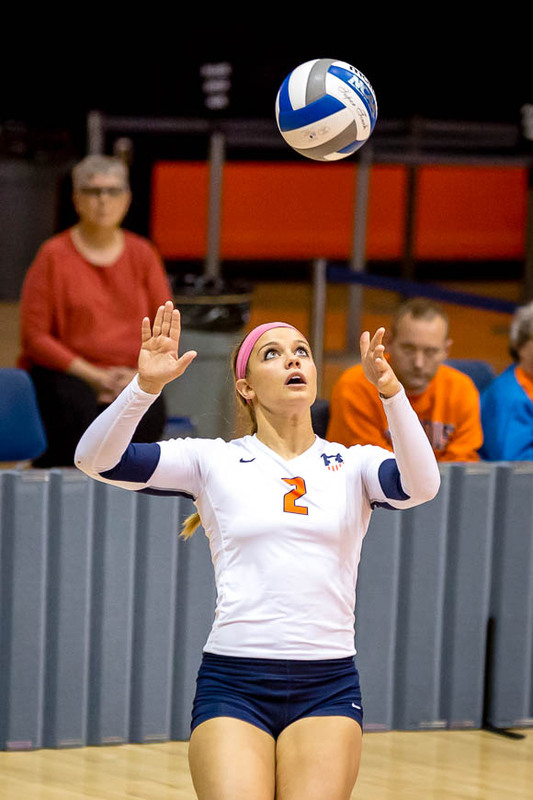 Less than a month later, she reached the pinnacle of her career when she signed a full scholarship to join the volleyball program at the University of Illinois -- as a defensive specialist. By her senior year, she was even team captain. At 5 feet 10, Julia was too short to be an effective outside hitter among the 6-1 to 6-4 pin hitting giants at the Big Ten Conference level. But, because she had developed strong back-row skills in high school, the Fighting Illini coaching staff took notice and awarded her a coveted scholarship and an opportunity to shine at one of the premiere Division I schools in the country. In this age of specialization, where many clubs, schools and coaches like to pigeonhole players at one position for years on end, Julia's story is a breath of fresh air. As Julia experienced, your ability to play a variety of positions and areas of the court and execute a range of different skills will increase your value, not only to your current team but for your volleyball future. This is especially true for middle school athletes. Players in fifth to eighth grade should not be narrowly defined into one position. Doing this not only will stunt their growth in the sport but is incredibly short-sighted. It is next to impossible to confidently predict what position an 11- to 14-year-old girl or guy is best suited to play before they reach high school. Here's just one example. The director of one of the area's largest clubs once confided to me how she wanted a middle school player on one of Serve City's teams to join her club the next year so she could make her a setter on one of her club's national teams. There was just one problem: While she liked setting and played some setter that season, the player in question absolutely loved being an outside hitter. She ended up sticking with Serve City the next year, and two years later she made her high school's varsity team at outside hitter. If she had been restricted to only being a setter, she wouldn't have realized that she was a great fit for outside hitter and wouldn't have discovered her passion for that position. Middle school is the time for athletes to experience as much of the sport as possible. This helps them develop into well-rounded players and get a taste of the full range of positions on the court to see where they might best fit in. This is Serve City's training philosophy for middle school teams. After I enjoyed a stint coaching 18U and 16U teams with another club, when I joined Serve City I coached three 14U teams. Most of the players on each team were trained at two positions over the course of the season and a handful even learned three or four positions. Regardless of their position in our lineups, all of the athletes were taught how to pass, set, serve receive, dig and hit no matter if they were 5 feet 10 or 4 feet 7, and each of them regularly practiced all of these skills. That doesn't mean athletes shouldn't learn and play a specific position. The team's tallest player can in fact be trained at middle hitter. But, at the same time, that tall middle hitter should be given numerous opportunities in practice to learn and refine other skills besides blocking and hitting. She should be regularly trained to set, serve, pass, receive serves and play back row defense, too. If she's trained to be a volleyball player first and a middle hitter second, someday she could find herself as a six-rotation outside hitter, a setter or a middle hitter who also plays back row in high school. Training middle schoolers in a variety of skills opens the door to greater future opportunities. This was true in my own family. My older daughter played setter in middle school but also frequently played in the back row both in serve receive and defensively as well. When she tried out for the freshman team at West Chicago High School, she made the team as a libero. Three years later, she earned all-conference honors as a libero, which never would have happened if she'd strictly played setter in middle school and never practiced serve receive. The need for players to be versatile doesn't end after middle school. Versatility is a valuable trait in high school, too, particularly at the large public high schools in the Chicago area. Let's say you are one of 12 outside hitters trying out for the freshman A team at your school, and the freshman A coach will only keep four outsides on the roster. Unless you're the clear-cut best outside hitter at tryouts, your odds of making the team will only increase if you display the ability to play other positions. If you have good back-row skills you could stick on the team as a DS or libero, or if you can also hit from the right side of the net, you could win a roster spot as an opposite hitter. Perhaps you're a good blocker who can make the squad as a middle hitter, or you have some experience at setter and can earn a spot as a combination setter and opposite hitter. The need for versatility continues throughout high school. If your school's varsity team is loaded with outside hitters, you may need to make the team and carve out playing time at another position. 1. Seek out opportunities to round out your game. I can't speak for all coaches, but when I coached high school club volleyball, if a middle hitter or right-side hitter asked me if she could get regular serve receive reps in practices, I would do everything in my power to make that possible for her. Be bold yet respectful and ask your coaches for instruction and for reps at a certain skill, even if that means staying 15 minutes after practice getting swings as a hitter with a teammate or coach setting you. And play grass doubles, quads and other games outside of practices, too. Sand doubles is the ultimate tool for developing well-rounded volleyball players. In sand you get to do it all: serve, serve receive, defend, set and hit. There's no better way to diversify your game than to train in the sand and play beach doubles. Just ask Julia Conard, who played sand volleyball to expand her game prior to college. Check out Chicago Sand Volleyball for more details. 3. Play for a club that trains versatility. I'm obviously biased, but Serve City is one such club, as many of you know who already play with us. Having coached at another Chicago-area club before coming to Serve City, I can attest that our training style promotes versatility more than most other clubs. I've personally seen clubs pigeonhole middle hitters on national teams so narrowly that the middles never received a single serve nor played back-row defense in any practice aside from an occasional scrimmage for the entire season, and setters never were trained to receive serves or to hit. Such a philosophy might suit that club and its teams just fine, but it does the athletes a total disservice. Even at the high school level, athletes should think of themselves not as outside hitters, setters, liberos and middle hitters but first and foremost as volleyball players. Like Julia Conard, one day they may find themselves needing to switch positions for the good of their careers or their team. I began working as Serve City's girls volleyball director August 15, but my journey as a club director actually was borne 32 years ago out of disappointment. As one of the veteran players on our boys basketball team, I had high hopes for my senior season of high school, but our coach didn't share those aspirations. He didn't push our team to grow or excel. He was a kind man and cared about each of us on a personal level, but he wasn't driven to help us get the most out of our talent as individual players or as a team. Our practices didn't stretch us outside our comfort zone, teach us new tactics or strategies, train and extend us to be our best or prepare us well for games, either. Not surprisingly, my senior season was a difficult one. Our team finished in last place in the conference, and my hoops career concluded on a dismal note. I still remember walking out of the gym following a lackluster season-ending loss thinking that, if I ever got the chance to coach my own team, I would push my players to reach their potential. I didn't want any athletes to experience the frustration and lack of development that marred my final basketball season. More than three decades and nearly 1,400 games as a coach later, I start my tenure as Serve City's girls director ready to pursue the same philosophy that has guided my volleyball and basketball coaching career since 1998. I believe the most effective way a coach communicates that they value their athletes is by giving their players the best possible coaching they can each day. Conversely, I believe athletes demonstrate how important their team is to them by giving their team their best possible effort at each practice and match. In short, excellence, improvement and realizing our dreams don't just happen. They take commitment, hard work, dedication, investment, enthusiasm, preparation and intentionality. At Serve City, sweat plus sacrifice will spur on success. I look forward to watching our coaches and athletes dedicate themselves to striving for excellence at each practice and match this season. The goal will be simple: to get "3 percent better" at their coaching or playing craft every day. If that happens, our athletes will experience significant growth in their skills and understanding of the game, our coaches will grow as leaders and teachers and our teams will make great strides throughout the season as well. Few things are more satisfying in volleyball than to watch your skills and knowledge of the game improve as you pour yourself into your development as a player or coach. We'll talk more about what excellence looks like in a practice setting in my next blog post. If you'd like to learn more about me, you can read the questionnaire below and visit my girls director page. Otherwise, I look forward to seeing you in the gym this season! Favorite quote: We are what we repeatedly do. Excellence, then, is not an act but a habit. What I enjoy most about volleyball: It's the ultimate team sport, teaching amazing life lessons about teamwork, sacrifice, putting others before self and playing for a cause greater than yourself. Best advice for athletes: There is no elevator to success. You have to take the stairs. Reid Priddy's speech at the Serve City Volleyball Banquet was inspiring and uplifting in numerous ways. One of my favorite takeaways from his story of how he grew into a decorated four-time U.S. Olympian was how his perspective on volleyball changed shortly after first being introduced to the sport in middle school. "I began playing volleyball all the time," Reid told our athletes, families and coaches at the banquet. "I couldn't play the sport enough." Reid's love for the game drove him to play volleyball every chance he got: in open gyms, his backyard, on the sand, at parks, during camps and clinics and on his school's teams. He continued this habit into and throughout high school, college and the professional and Olympic ranks. Now that most of Serve City's girls teams have wrapped up their seasons, you might be wondering what your daughter (or your son) can do next to continue fanning the flame of their love for volleyball. Following Reid Priddy's advice, here are four ideas to help your child keep developing their passion for the sport along with their skills and understanding of the game. 1. Play the sport recreationally. Reid's love for the game grew largely out of playing the game with his friends outside of structured team practices and matches. This is also where your kids will learn the game more than any other venue. Volleyball requires countless hours of play in order to learn how to read your opponent -- looking across the net to determine when your opponent is hitting vs. tipping, where they are going to hit or pass the ball to before they even contact the ball, where they are setting to and where and how they are serving. This massive amount of information can only be instinctively learned through game play. Plus, playing pick-up games of 6v6, 4v4, 3v3, 2v2 and even 1v1 will refine and sharpen your daughter's or son's all-around skills and ability to make split-second decisions, the latter of which is a crucial skill in and of itself in volleyball. And, of course, playing the game will stoke your child's passion and appreciation for the sport. Participating in summer camps is an excellent option for a couple of reasons. It exposes your daughter and son to new coaches and different and fresh teaching methods than they have received during their club and school seasons. Camps also give your child new ideas on how to pass, set, hit, block, defend and execute other volleyball skills that they can then take home and work on when they play recreationally this summer. Taking private lessons. Summer is a good opportunity for some athletes to train individually with a private coach, as they can hone in on specific skills they need to learn or sharpen and raise their level of play prior to the start of the upcoming school season. Competing in sand and grass tournaments. Both outdoor versions of the sport are popular in the Chicago area. Learning a new position. One of my former players at the club where I coached prior to joining Serve City decided to play beach volleyball one summer so she could expand her game. Due to her height and frame, she had been pegged by her club coaches as strictly a middle blocker, so she joined a sand program to work on her serve receive and defensive skills in an effort to grow into an outside hitter for her senior season of club. My older daughter did the same thing, hitting the sand to improve her passing skills the summer after eighth grade and transition into a libero in high school. Has your daughter or son benefited from years of coaching, instruction and input through club and school teams? This spring and summer they can begin giving back to the game by volunteering their time. They could serve as a volunteer assistant with a YMCA or park district league or help out at local camps for elementary-school kids. Paying it forward will keep them involved in volleyball while teaching them the other side of the game and perhaps sparking a future interest in coaching. Even if they don't take to coaching, teaching the game to younger children will help your child develop a greater understanding of the sport and improve their volleyball IQ for their next season as a volley athlete.